The tiny church in the picturesque hamlet of Balquhidder is at the centre of an increasingly popular Scottish pilgrimage. 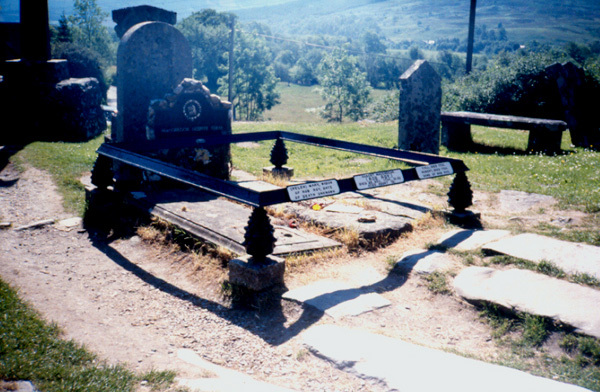 For the famous outlaw Rob Roy Macgregor is buried there and each year thousands of visitors seek out his final resting place, many spurred on by the recent Hollywood movie starring Liam Neeson and Jessica Lang. Rob Roy, a reiver and retriever of cattle, died in Balquhidder in 1734 after a lifetime spent roaming the mountains and glens of the southern Highlands. The church, where he lies alongside his wife Mary and two of the couple's four sons, is also the starting point for a walk up Kirkton Glen to a remote lochan in the col at the top. The grave sits in the shadow of the ruined original kirk just a few yards from its replacement and is well worth a visit before you set off or when you return. A narrow path heads off from the back of the churchyard. It runs through the trees towards a waterfall but before it reaches this, signs for the footpath point up to the right. Follow these to a stile over a fence then continue up a track ahead. This climbs to the left of a large green metal box and continues to rise steeply through the trees to a fenced enclosure, part of the public water supply. A short way on a crossroads is reached. Several wide tracks converge here. Carry straight ahead, up Kirkton Glen, keeping a burn in the dip of the valley to your left. The track climbs, but at a more gentle rate now. The forest here has been felled recently and there is some new tree growth. Keep your eyes peeled for red squirrels. As it rises the track disappears into the trees again before emerging just short of the top of the forest. The track forks with the left hand arm continuing north and the right one curving east. 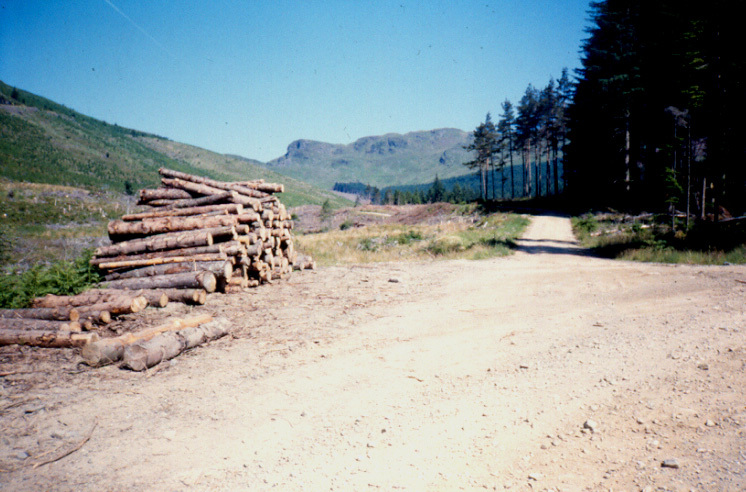 Ignore both and instead take a narrow path straight ahead signed to 'Glen Dochart'. This climbs over a recently felled stretch of ground to a fence at the top of the forest. The path continues to climb, now over grassy hillside. 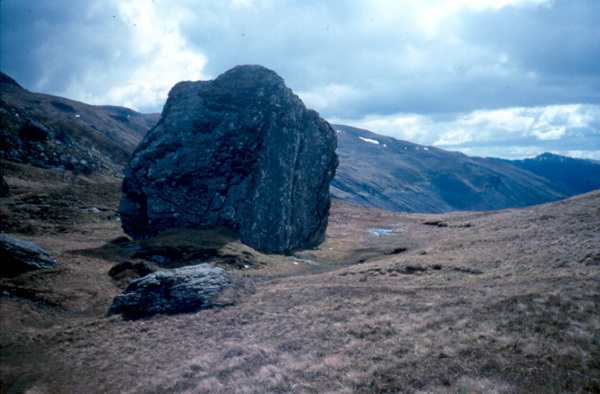 It curves to the left before heading east and then north under the craggy towers of Meall an Fhiodhain. At the col, the way reaches a metal fence and gate and to the left a small stretch of water, Lochan an Eireannaich, nestles in a shallow bowl on the hillside. This is ideal for a paddle or swim on a hot summer day but watch out for the odd metal can or length of wire on the bottom. You may also spot shoals of fish or tadpoles, depending on the time of year. From the lochan retrace steps to the forest track. Back on the track, turn left and follow the way as it rises before flattening off to run along the hillside, through tall trees then an area of new saplings. There are excellent views down the glen and over Loch Voil. The track runs level for two miles before curving right and dropping to the crossroads. From there, retrace steps to the start. Start/parking Balquhidder church (grid ref NN 536209). Grading Forest track and path throughout. A fairly strenuous ascent up through Kirkton Glen, suitable for reasonably fit walkers. Sheep grazing on higher ground above the forest so dogs on lead there.